Getting your earnings via Paypal can be both fun and frustrating at the same time. It always feels very fulfilling receiving revenue over the platform, but at some point we may very feel lost as to how we can make use of our Paypal earnings especially for us Filipinos wherein the use of Paypal can be limited. 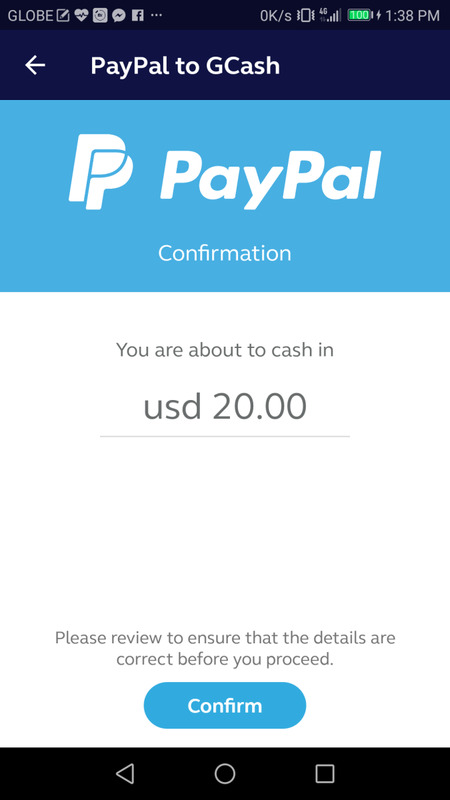 Thankfully, there is now a mobile app called "GCash" which we can use as an option to withdraw earnings from Paypal. In this article, we will be learning as to what GCash is and how to make the transfer. To give you a brief idea, GCash is a service by Globe, one of the leading telecommunication network in the Philippines, which eventually evolved into an app. It's basically a digital wallet where you can transfer funds to peers and buy prepaid load. The good thing about using GCash as a way to withdraw your Paypal balance is that they don't charge anything. Also, there is currently no minimum amount to make the transfer. Now, I find this very useful because normally I needed to wait for my Paypal balance to reach P7,000 just so I can avoid the P50 bank transfer fee. With GCash, I can immediately do the transfer. Another thing I noticed is that the transfer happens in real time. Typically, when withdrawing via a bank, it takes me a total of 5-7 days to receive my Paypal balance. With the app, the earnings gets transferred immediately. 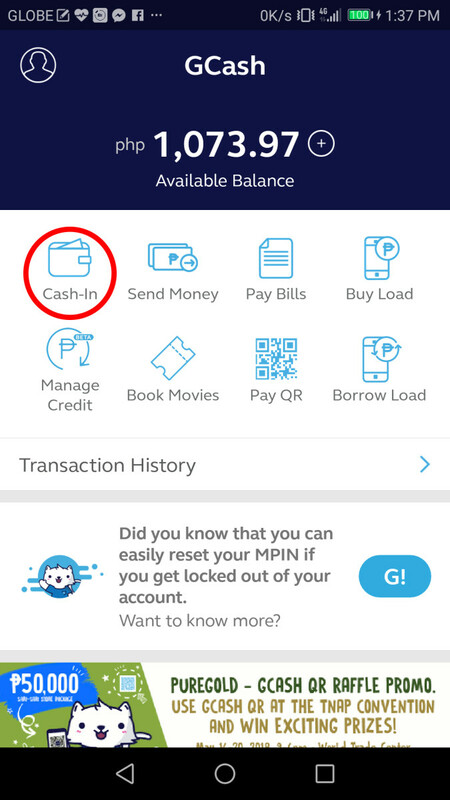 Why should you transfer/withdraw your Paypal balance via GCash? To ensure smooth understanding of the procedures, I listed below the general outline on how to withdraw Paypal balance to your GCash wallet . Now, if by any chance, you are familiar with any of the steps, feel free to just skip any of them. Okay, so the first and the most vital step is for you to have a GCash account. Now, if you don’t have any GCash account at the moment, you can download the app into your phone and register from there. Note, however, that you can only register via your mobile phone, since it redirects you automatically to either Google Play Store or Apple App Store. The registration steps are very easy to follow. 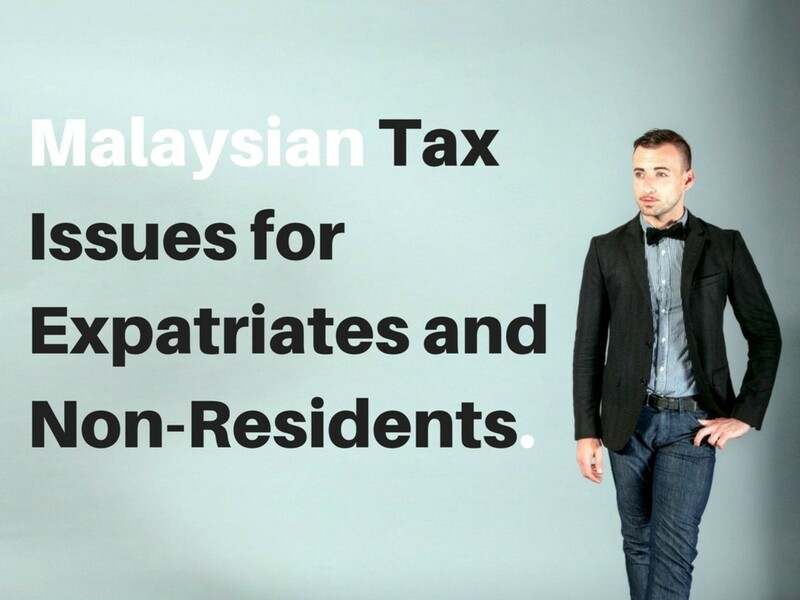 You just need to provide the usual basic information such as your name, occupation and address. Once you already have your account, the next step is to authorize GCash to transact with Paypal on your behalf. There is a bulit-in feature inside the app where you can do this. All you need to do is to click on “My Account” then press “Paypal”. The app will then ask you to input your Paypal email address. Upon tapping "Proceed", you will be redirected to the Paypal website within the app where you'll input your password. Tap on the “Authorize” button to confirm. 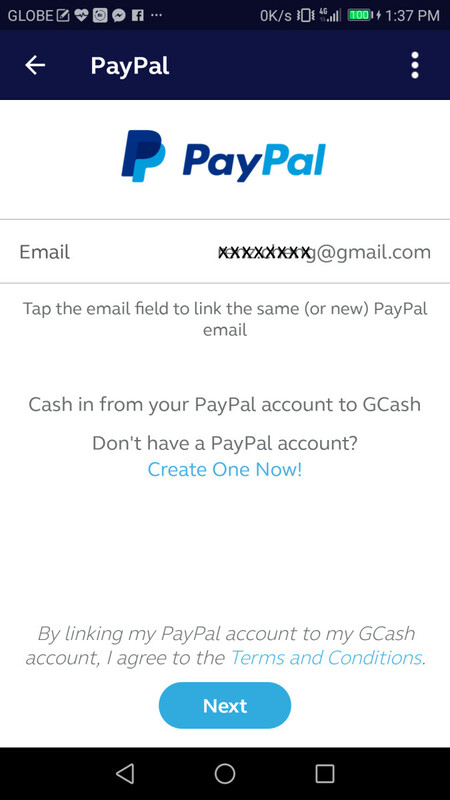 After this, you’ll receive an email from Paypal for successfully authorizing GCash. By this time, you are almost ready to have your Paypal balance transferred to your GCash wallet. Now, if you are having difficulties following the procedures, you may want to check out the images below to assist you in this step. Just tap on the thumbnails to see the images. 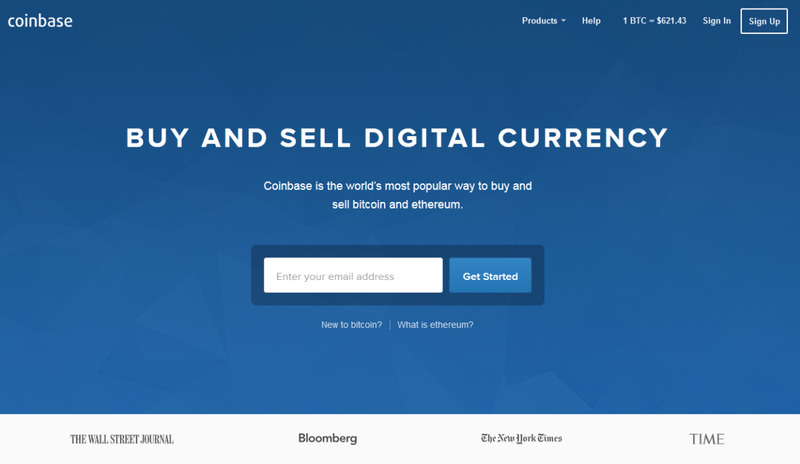 On the home page, just click on the button at the upper leftmost corner to access "My Account"
Upon clicking on "My Account", press on "Paypal"
The next step is to tap “Cash In” and then “Paypal to GCash” where you enter the amount of any currency you want to transfer. 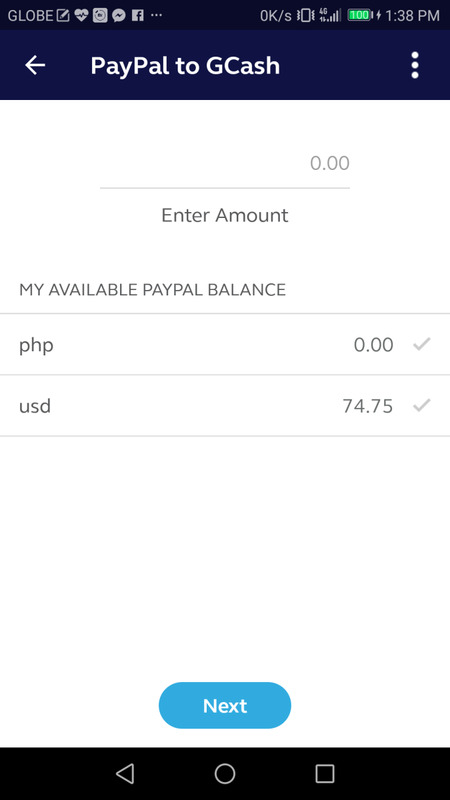 Paypal then automatically converts the balance to PHP at its prevailing rate, and instantly transfers it to your GCash wallet. Again, feel free to navigate through the photos below to assist you in transferring Paypal balance to your GCash wallet. Then tap on "Paypal to GCash"
You will be asked from which balance you intend to withdraw. Since I have USD, I tapped on USD. If you check your Paypal, the transaction will be recorded as well. 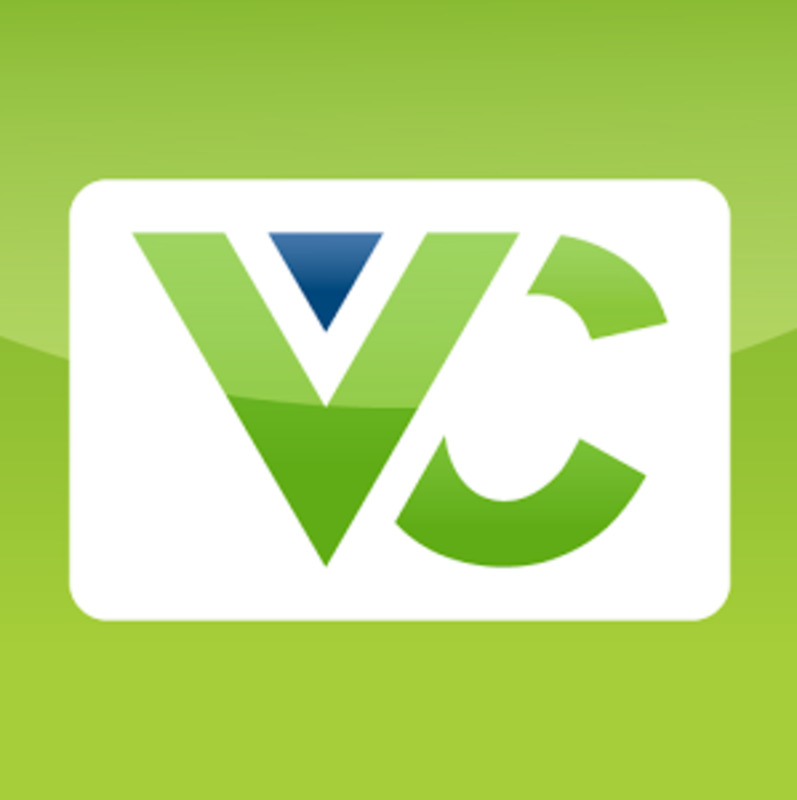 Since the crediting is done instantly, you can immediately use the funds to pay for your bills. You can do this by tapping onto the "Pay Bills" icon on the home screen and you can select from the list of merchants with whom you want toto transact with. Normally, you will find there a few Credit Card companies, utility companies (such as Meralco) and etc. There are also a handful of stores and restaurants within the country that are now accepting payment via GCash, so you can use it there as well. Now that you know that you can withdraw using GCash, will you be using this service for your Paypal balance moving forward? No, I still want to have my balance transferred to my bank account. If you have any problems, comments or suggestions regarding the topic, just feel free to drop some comments below, and I'll try to help you out the best way I can. Can I cash out a physical money after transferring my money from Paypal to Gcash? Yes, you can. There are partner remittance centers where you can do the exchange. 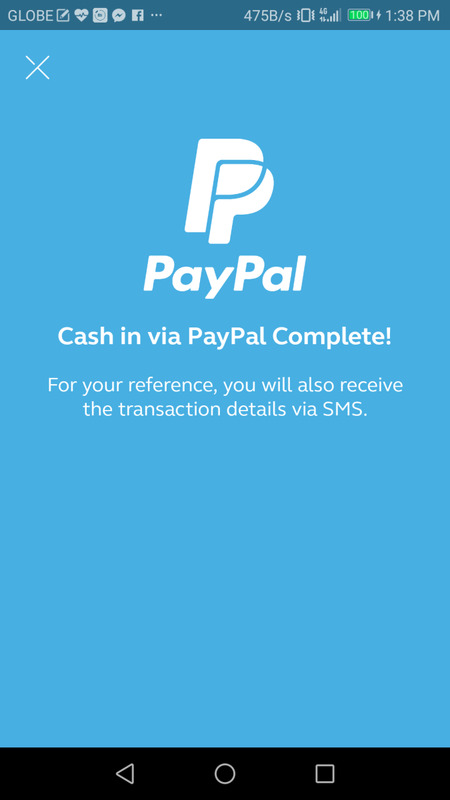 I was able to cash-in my Gcash from Paypal. I saw the transaction history confirming this transfer. However, when I checked, my Gcash balance did not reflect the transfer. What should I do? First, you might want to refresh the app. Gcash system often goes into maintenance, so there can be glitches. If that still doesn't work, you can check whether your Paypal got deducted. If it did, you can take screenshots as well as the transaction history and sent these to Customer Service. These are the only solutions I can think of regarding this matter. My GCash has been authorized, and I Already had a transaction last year. why can't I transfer now? There might have been updates implemented by either/both sides, which is why you may need to re-authenticate PayPal transfer. Why is GCash not letting me cash-in via my PayPal? I reached out to Paypal, and they told me that my account is in good status. When did you try cashing in? I did one just recently, and it was successful. Is your GCash verified? Maybe that can be the reason. Though I do believe this facility is available even prior to verification. I can't link my Paypal to GCash. What do I need to do? 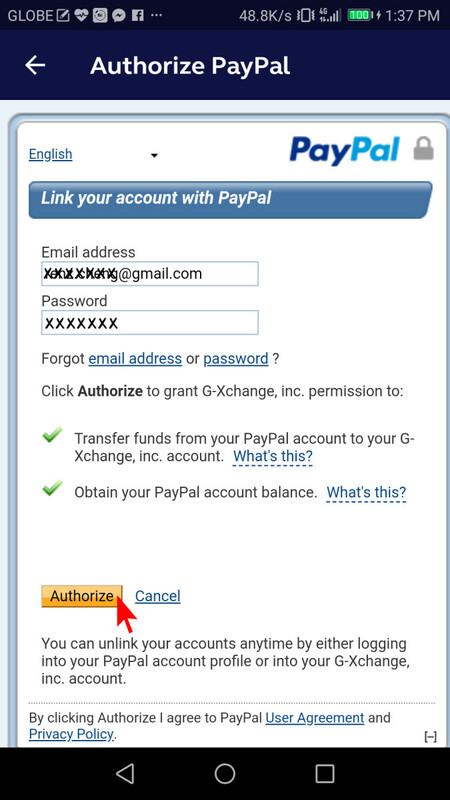 -Remove any existing permissions/autherization of Gxchange in your Paypal. Then, try to redo the whole process. -Ensure that the name matches for your GCash and Paypal. 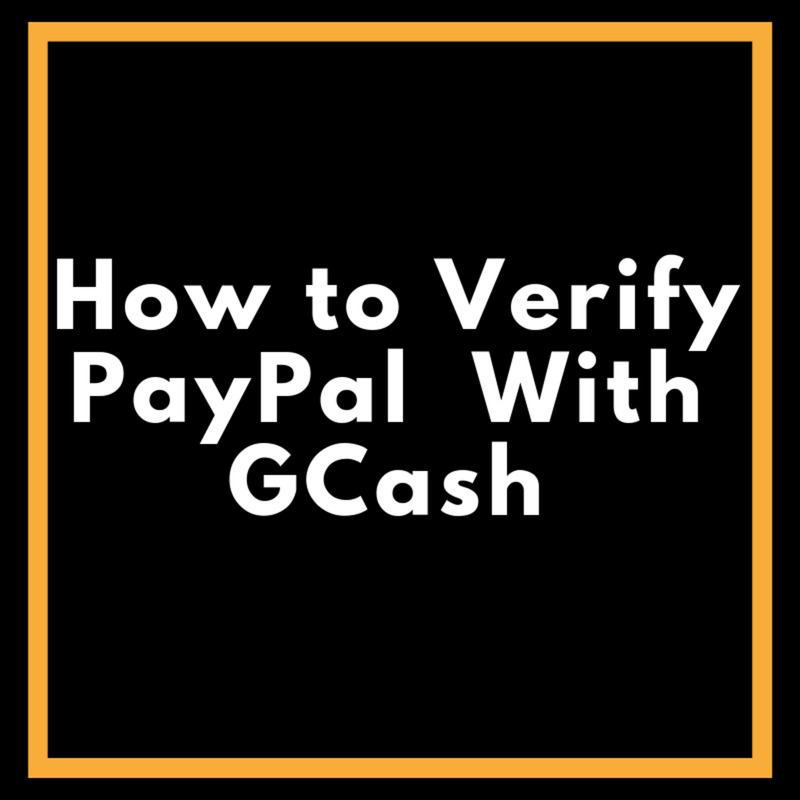 Can I cash-in from Paypal to GCash even if I'm not yet verified? If not, how to be verified? I don't have bank account. Can I use other bank account not in my name? I did a quick check, and it seems like verified Paypal account is not a "requirement", but rather "recommended". Regarding your last question on using a different account not in your name, I believe it's not possible. They'll match it with the name of the Paypal user. Can I transfer or send my money to my Paypal account? Upon checking the current features, there is no facility that will allow us to do this. You may, on the other hand, link the GCash Virtual Card to Paypal. I can’t cash-in using PayPal. I followed your instructions but still could’t proceed with my cash-in request. What should I do to complete my PayPal transaction? Based on observation, the Paypal could only be linked and successfully processed if the name matched with that of your GCash. You may also want to check whether your app is the latest version. Lastly, make sure to delete all preapproved payments related to GCash in Paypal before re-starting the registration. Can I send money from GCash to Paypal? 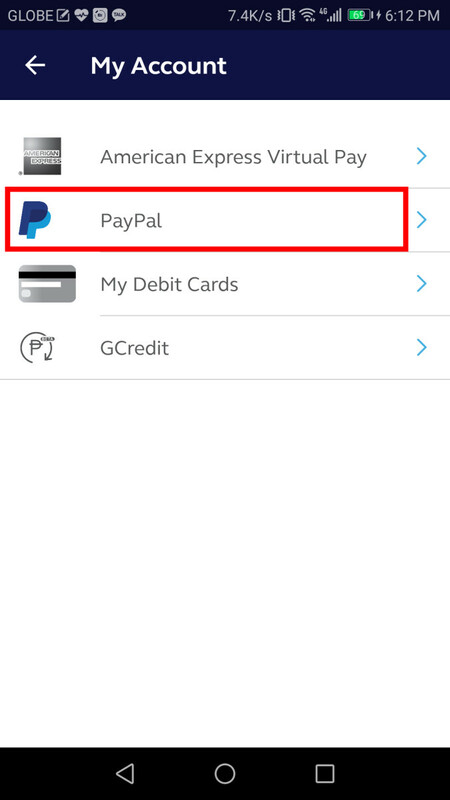 Is it possible to transfer money from PayPal to GCash If I don't have PayPal account? Unfortunately, this is not possible. You need to authorize the transfer from your account. Hence, having an account is necessary to do this transfer to GCash. Can I transfer money from Taiwan to the Philippines using GCash? It is possible but only if you have a GCash account which requires a Globe mobile number for registration. 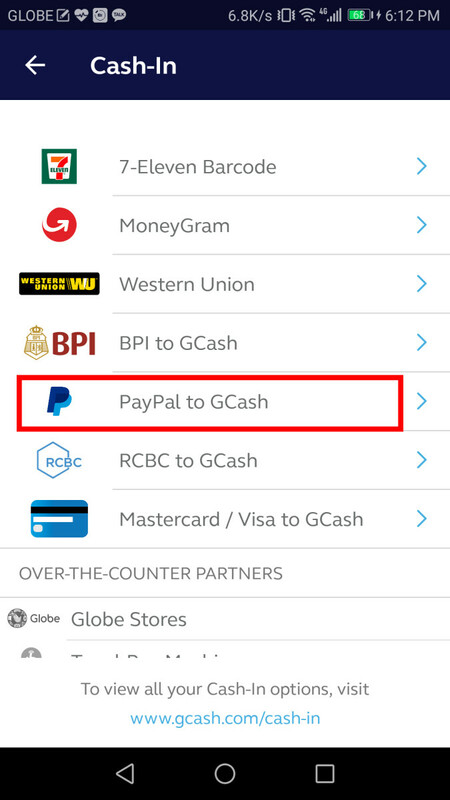 Once you have a GCash account you can forward the money you'll withdraw from Paypal. Can I send money from my PayPal to someone's GCash that's not mine? Can I directly use GCash to get money from China without using Paypal anymore? This is possible, but only if the sender uses Western Union to give money to you. Other than this, you'll be needing Paypal as a way to do the transfer. Is it possible to transfer money from one person to the next in another country to my GCash account? It's possible, but may become inconvenient. GCash requires verification via OTP from time to time, and if that person in another country won't have access of his OTP, then he won't be able to use his GCash account to send money to you. The work around is for them to send money via Paypal, and you'll cash it in via GCash app. how about gcash to paypal? @Jean the transfer should be almost instant the moment you press confirm. 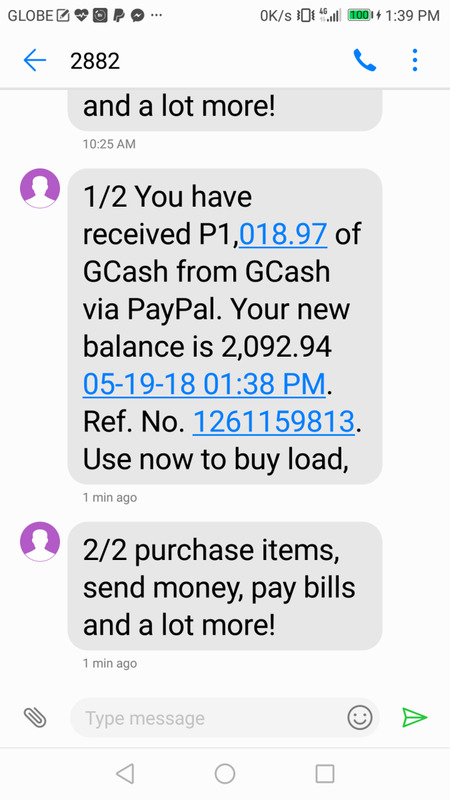 How long does it takes to receive the money I transfer from my paypal account to gcash po? I’ve been trying to connect my gcash to paypal, everytime I click ‘authorize’ and the screen says “We are unable to link your account. Please make sure your credentials are the same in both your Paypal account and GCash wallet.” Ill receive email about the preapproved plan but just seconds after Ill get another saying it has been cancelled. I don’t know what specific credentials they could mean. My name is exactly the same, as well as the number and email address. I called gcash but no help. Restarted my phone, uninstall, installed. Didn’t work. Do u have any suggestions? Thank you so much...very helpful..
help! I can't even link my gcash mastercard to my number. "oops. There must be something wrong with the gcash mastercard linking. Please try again later"
Every time I try to cash in my paypal funds to gcash it just gives me this error message.
" Sorry, we are unable to proceed with your cash-in request.Please ensure that your PayPal account has been activated or that there are no security restrictions on your account.You may contact PayPal Support for more info." @Hasmin there were updates and changes with the Paypal feature, so it really requires to remove the old, and relink it back. Now if this happen still afterwards, then you may want to ensure you have the latest GCash app version. If this stil doesn’t work, the only thing I can think of is GCash customer care. everytime i cash in using my paypal why it keep saying to relinked my paypal account? @Shine You may try redoing the process, though I haven't tried using the Paypal transfer in a month. Is this your first time to cash in via Paypal? 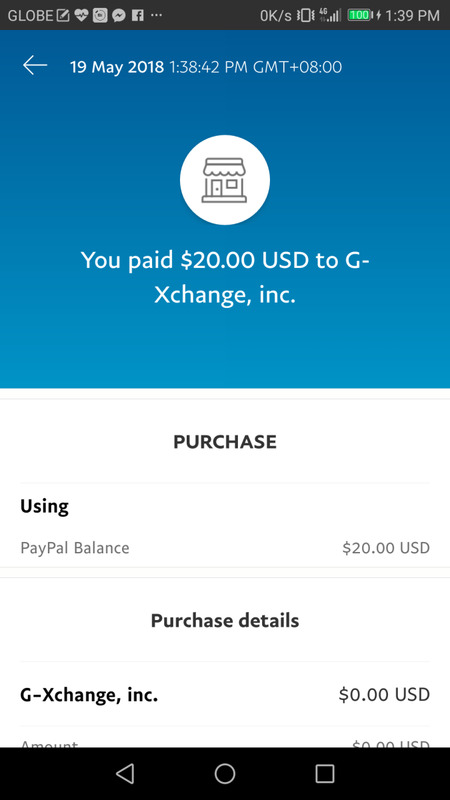 What is the minimum amount allowed for me to transfer funds from my paypal to my gcash wallet? can i cash in from paypal to gcash if i haven't a bank account ? does gcash card can do? I cant Connect my gcash to my paypal. It would lead me to preapprove payments but when i looked at the box of preapprive payment wherein i have to confirm.theres none. @YKN That's true. 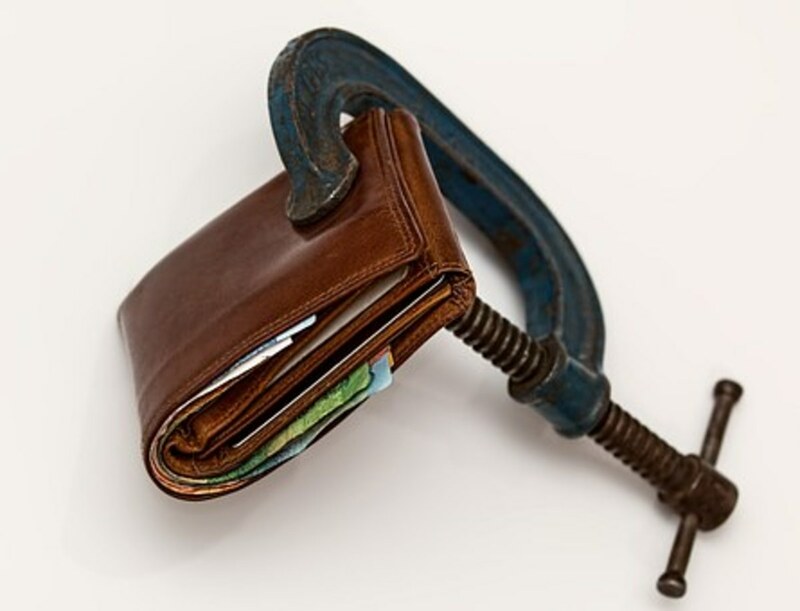 Paypal implicitly gets its revenues by lowering conversion rates. Although the same rate applies when you opt to have the USD balance deposited to a PHP deposit account. Still, it's good to let people know of this. Thank you for bringing it up. @Rowenna I believe I was wrong. They might need the accounts to have names that match. @Rowena I believe this is possible, since you'll be getting his "permission" by authorizing GCash to get balance from your dad's Paypal. If this technique doesn't work (which I don't think will be the case), you may need to open a GCash account for your dad.